White bread and heavily-sugared coffee start the day for Maria, her husband, and the 9 kids and grandkids that live in their 2 bedroom house. . . when there’s money. Those who attend elementary school also sometimes get a hot drink called Atol in the morning – a customary Guatemalan beverage made from ground corn and sugar. But this small school snack, provided through government nutrition subsidies, will not alleviate their hunger for long. With the expenses of feeding eleven mouths, and with 2 children traveling to another village for school, money and food are a constant worry for Maria and her family. Over the years, 46-year old Maria has held various jobs to supplement the money her husband brings home from his government job. She has sold plates of food out of her home and raised chickens to sell their meat. To her dismay, the chickens did not survive and rice and beans were not enough to encourage customers to buy from her. Maria’s children contribute when work is available, but inclement weather and the ebb and flow of tourists often dictate these opportunities. “The kids are always very happy to get their eggs at school. They always want breakfast but we don’t always have money for breakfast. 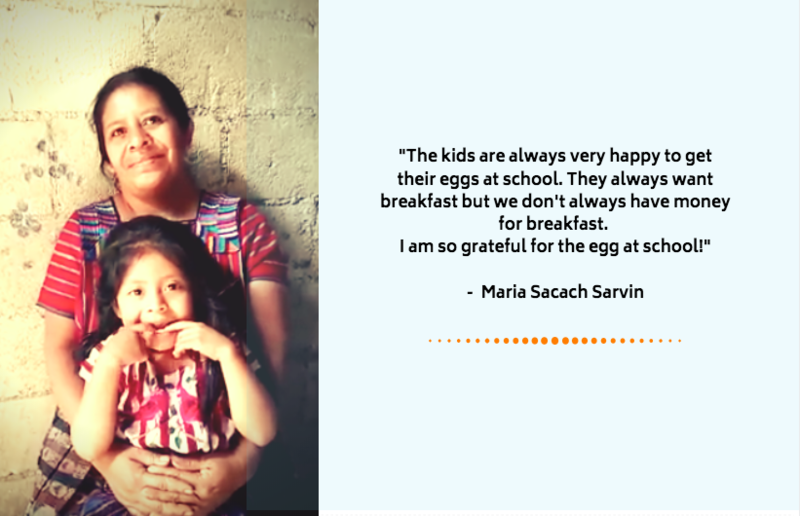 You can help ensure kids like Maria’s get a healthy school breakfast all year. Donate today to transform their future! Next Next post: Meet Brenda Leticia, our first farm employee!